Pascal the little prince in his cool ride. Last night I loaded our freshly refinished (in RAL 2004 “pure orange”) dinner table into one of our big, classic rental bakfietsen in order to bring it home. 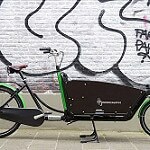 This morning I was then faced with the dilemma of how to both return the bakfiets to the shop AND bring Pascal to his “creche” (daycare center), both about a kilometer or two from home. Do I dare let an almost two year old sit in the 190 x 85cm box untethered, unhelmeted, unpadded, unrollcaged…? After some deliberation with Mama-en-meer we decided that it should be OK, particularly since Pascal has logged enough thousands of cycling kilometers to not have much urge to do anything stupid and terrible-twos-toddler-like. 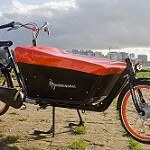 Besides, we figured, the bakfiets has a top speed of about 10km/hr and everybody (even taxis!) gives it a nice, wiiiiiiide berth. The old table I just painted orange. So upon arriving at street level instead of Pascal climbing into mama’s cargobike or being lifted onto papa’s Workcycles Fr8 he was propped into the back of the bak, tucked between the moving blankets and my courier bag. I released the parking brake between my legs and rolled off the curb, still curious whether child would just stay where I put him or insist upon “exploring” the nearly two meters of mahogany playground in front of him. I’m happy to report that we figured correctly; Pascal was perfectly happy to sit back near me, feet out front, calling out the “autos”, “cheeps”, “big ships”, “monononos”, “bicipas” and “tjams” as we rode. We got a few approving smiles and no disapproving looks that I could see. 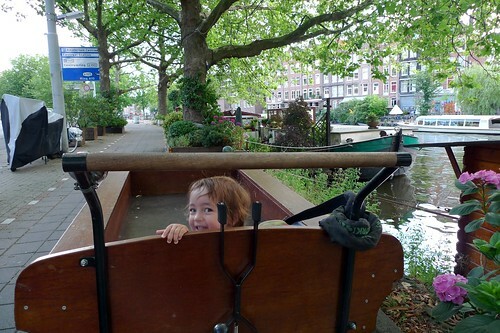 Isn’t it unfortunate few kids outside of the Netherlands can have such experiences? We always go on this bike now? 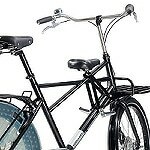 This entry was posted on Wednesday, July 28th, 2010 at 08:08	and is filed under Bike Friendly Cities, Bikes in use, Cargo trikes / Bakfietsen, Child and family transport, Henry and his family. You can follow any responses to this entry through the RSS 2.0 feed.You can skip to the end and leave a response. Pinging is currently not allowed. Paschal Looks very Relaxed Sitting in the Bakfiets unlike Children in other Countries who are Wrapped in Cotton Wool when they sit on Bikes with Helmets on their Heads and sometimes Strapped in. The Nanny State at Work Frightening People away from Cycling,of course the main difference is the very bad Infrastructure for Cycling in those Countries. Very Handy Contraption for Carting Sheets of Timber or Wooden Veneer for making Furniture from the DIY Hardware Stores.,These are usually over two Metres Long in Length. Also if you had a mind you could do a bit of Undertaking in your Spare time, Very Handy for Carrying the Coffins. You could also use it for carrying Ladders if you had a Window Cleaning Business. 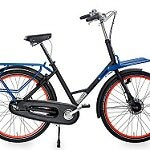 In Dublin People are starting to use Bikes for Selling Ice Cream or even Food on Match Days at Croke Park The National Gaelic Football Stadium or over in Landsdowne Rugby Grounds. 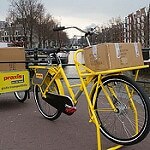 They have Three Wheelers with the Box in Front I suppose like Nihola. It is slowly Happening now on the Streets,every so often if there is a Festival on you will find someone Selling Coffee and Sandwiches or Ice Cream. What is so unusual about that you might ask,nothing really except it is unusual for us. This sort of thing went out of use about 50 Years ago but is slowly Creeping back into use. 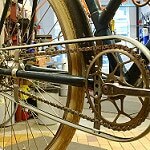 There is a New Renaissance for Cycling in Ireland, with lots of Cyclists and some nice Bicycles like Pashleys and Dutch Bikes and Old Raleighs now on the Streets. Agreed on all counts. Our boys are now experienced Bakfiets riders and love being up front and seeing the view. 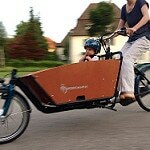 They get a lot of transport envy from other children as well: I often have requests to give neighbours children a ride. You’d think this, and the fact I can usually get my boys home in the time most people need to strap their kids into the car, would get people interested in alternatives. 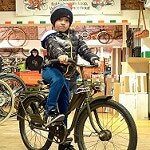 It is indeed a shame that almost nobody outside of Northern Europe enjoys this pleasure, or indeed just being able to put their child on/in a bike without the fear of being jailed for child abuse (particularly if they are not helmeted, wrapped and securely buckled in with a massive harness). Sure, being careful is good to a point, but when we get to the point that every single situation requires massive preparation to be perceived as “safe”, something is very wrong. One of the biggest draws for me about the Netherlands is that open feeling that seems to exist in the culture – there doesn’t seem to be that oppressive sense of fear that seems to hang over the U.S.
@Todd: Last week there was an article in Dutch magazine Elsevier about child safety in cars, detailing that up to the age of four children should be strapped in rear-faced child seats. The same doctor who appeared in the Volvo campaign, William Kramer, explained that as a child’s head represents about a quarter of it’s body weight, it should be restrained as much as possible. He himself always sat in a rearward facing seat when travelling by train. Now I can accept that forces in a speeding car that is suddenly brought to a standstill are high enough to kill an unrestrained infant. I remember driving along at 50 km/h with the (small) dog lying on the rear shelf enjoying the view, as I suddenly had to brake for a farmer and his tractor turning into the road – rural environment. There were some frantically scrambling noises from behind and then the dog flew across the car up to the windshield. No harm done but he kept looking at me rather reproachfully for several hours. And back to the child: if we were to act on all recommendations regarding child safety in cars no child would ever voluntarily get into a car. No fun at all. Which might be a good thing, in the end. @Fritz: On that Ad Council page it says “… 3 out of 4 kids are not as secure as they should be because their car seats are not used correctly…” is rather vague, and how does this translate into number of injuries? How did they determine this number? That LATCH programme has been in effect for nearly eight years and so presumably most people have compliant equipment but are still doing things wrong. What is going on here? Also, do the parents that figure it out also know how to drive better? It’s all just so simplistic to focus on a car seat, when probably a lot of the parents involved are making other bad mobility choices. Did I ask if undertakers wanted to use this bike…for you know what? @Todd: No idea. Never thought about it and prefer to keep it that way. When I’m in a car as a passenger (haven’t driven for over 30 years) I buckle up and hope the driver knows what he/she is doing. And if I’m ever required to wear a helmet in a car I’d rather walk. The image of your kid in the big bike’s bak triggered a memory, but it took a second to become clear. Ah yes, Roald Dahl’s “Danny, the Champion of the World,” in translation, illustrated by Jill Bennet. Young master Klopsteen sitting in a stretch-pram, on top of a thin sheet covering hundreds of dead pheasants. child safety? I feel compelled to share something I saw yesterday that flabberghasted me – a 50ish woman picked her baby grandchild (6 months?) up from the daycare at the same time as me, and as I was putting my son into his handlebar seat, she got into her car with the baby on her lap, and drove off (no belts for either of them). I was so shocked I followed her, and unbelievably saw her turn, turn again, and then turn onto the main road double-lane no-central-reservation rush hour traffic that I consider too dangerous to cycle in. Speechless, I quietly cycled home (via the back roads as ever) as Allen burbled away cheerfully. There was a baby seat on the back seat of that car – apparently the woman couldn’t be bothered to use it. Unbelievable. For clarity: I live in Okinawa, Japan, and yes she’d get a ticket if the cops saw her. But who would do that for anything? 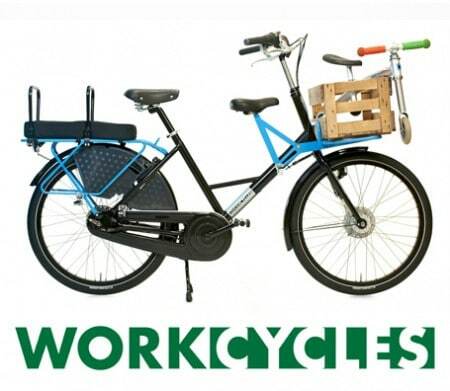 I’m starting to consider emmigrating to holland…. Beautiful! 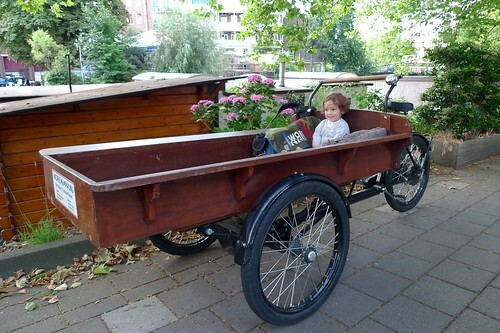 I love it that you can trust your child to sit while you pedal, that you could raise him in a place where bikes are given respect, and that you had such a great cargo bike to use! My husband and I (both Americans) moved from more suburban and urban areas to Montana (northwestern USA) in order to get away from a culture that feels that anything less than overboard safety measures are child abuse, and we haven’t regretted it. The only problem is that car is still king here, and I do insist that my children wear helmets, just because I can never tell what chances drives might decide to take with my children’s safety. 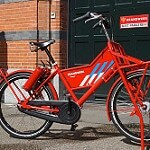 I dream of living in Amsterdam or Copenhagen where everyday biking is taken for granted and is very safe. Thanks so much for this post and the wonderful pictures! Re Pascal: ‘t Is een bijzonder kind, en dat is-ie! 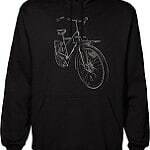 Henry: Re children on bikes, did you see this? My 4 year old’s preferred position in the cargobike is laid on the floor of the bak facing me, using a blanket as a pillow. That, or hiding under the flat cover and jumping up and scaring people. Neither involve seat belts or helmets. It’s only within our village, and at the speeds we go, on the roads we use, the minimal risks are hugely outweighted by the social rewards. Ha ha regarding “limo” above: They probably found this through a Google search, so to attract other competition you might want to add terms such as “electric car” or “Nissan Leaf”, etc to various future entries… as I have to this one. Sorry, I deleted that spam comment before I saw your response. I just get rid of all that crap, even comment that are semi-related but essentially just excuses for uninteresting links. I want to keep the discussion here clean and focused on the topic. 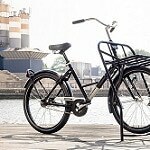 Really like this blog, would be great if the Dutch (and Danish) cycling culture becomes popular everywhere in Europe. 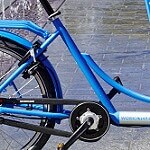 I think Dublin is heading in the right direction with more bicycle lanes and more dublin bikes. 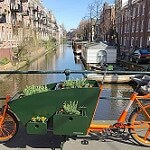 The bakfiets is great and I am very glad that they are now available in Ireland as well. 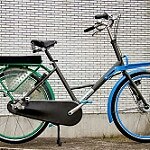 I read in the Irish Times about a company called bear bicycles that import them from Holland. Must try one out soon!